As we continue our review of the heavenly signs surrounding the replay of the Rev. 12 wonder, Part 1 of this review focused on the Triple Conjunction of Jupiter-Spica in Virgo. 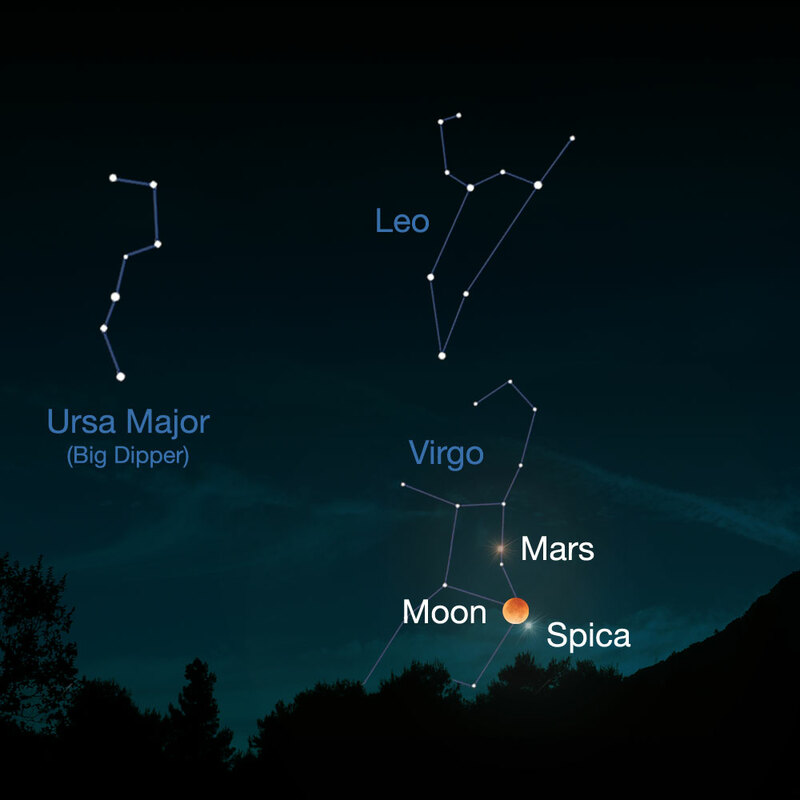 This post will feature the Mars-Spica triple unions in Virgo, that began in the Spring of 2014. Since we did not initiate our Blood Moon Blog until July of 2014, we did not provide the in-depth coverage of the first signs of the 2014-2015 Blood Moon Tetrad, as we have since. This Blog post will help rectify that oversight. First however, we need to give some added context to the backdrop of the Rev. 12 sign in light of the Celestial Sphinx. 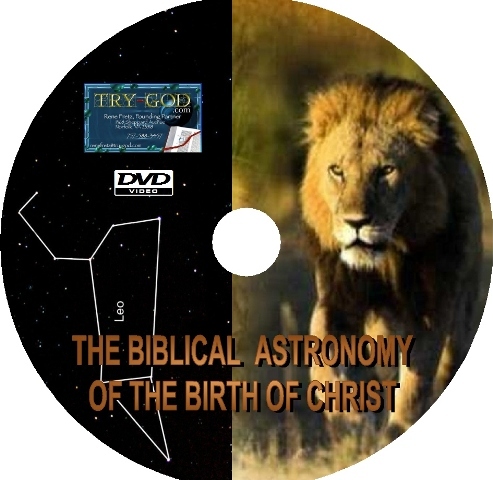 As we saw in Part 1 of this study, heavenly signs in Virgo and Leo require extra attention since they embody the alpha and omega constellations of the Mazzaroth, the Hebrew Zodiac. Virgo’s seasonal position in the skies in relation to the Harvest seasons and feasts of the Hebrew Calendar speak volumes to us, and was something the faithful of Israel paid attention to in light of the OT Book of Ruth below. God’s plan of redemption was structured around the feasts of the Hebrew Calendar illustrating future events in Bible prophecy. The better we understand how these feasts are fulfilled in the ministry of Christ as Prophet, Priest and King, the fuller our grasp will be of the end-times we are living in. The Feast of Unleavened Bread shows the resurrection of Jesus Christ as the first-fruits from the dead, [I Cor. 15:20-23]. The wheat harvest of the Feast of Pentecost aligns with the giving of the holy spirit on the Day of Pentecost, when the apostles and believers first spoke in tongues. The Feast of Tabernacles depicts the resurrection of the just and unjust, in the harvest at the end of the world.1 This was highlighted by the 2014-2015 Blood Moon Tetrad especially in the Blood Moons during the Feast of Tabernacles of both years, emphasized during the Jubilee year of 2015. As the first-fruits from the dead, Jesus Christ is the crown of God’s spiritual harvest, being resurrected at the first harvest during the feast of Unleavened Bread. At the very time of offering the first-fruits according to Leviticus 23:10-11, Jesus Christ furnished himself as the first-fruits from the dead, the first in a long line of believers who will conquer death. One aspect in the celestial relationship to these feasts is seen clearly in connection with the Book of Ruth. This short story in the OT Bible record holds great insight for our understanding of the Lord’s Feasts, as they relate to the 1st and second appearances of the Lord Jesus Christ. Ruth was a Gentile woman, of the Moabites, who by God’s Grace and Mercy was included in the Royal genealogy of King David. Ruth 2:11-12 records Boaz’ high opinion of Ruth and her reward, for her trust under the Hand of the God of Israel. Ruth came to Bethlehem with Naomi, at the start of the Barley harvest [Ruth 1:22 to 2:22], gleaning in the fields of Boaz to the end of the Barley and Wheat harvests, [Ruth 2:23]. Following this she obeys Naomi’s instruction to go to Boaz, activating her right of the eastern custom called kinsman redeemer. Since Boaz was part of Naomi’s family, and both Ruth and Naomi’s husbands had died, it became Boaz’ right to take Ruth in marriage, if a closer kinsman didn’t activate this right ahead of him. Ruth 3:9 shows how Ruth presented herself to Boaz and how he covered her with his cloak, signifying his acceptance and protection of her, in their resulting impending marriage. As we consider the skies during this time of year in Israel, its instructive to realize Virgo’s position during this harvest season. When viewed historically, we find astronomers as early as Caesius, linking Virgo with Ruth gleaning in the fields of Boaz.3 Annually we find Virgo’s position mirroring the harvest seasons as follows. Virgo arises in the East during the Barley harvest and Wave Offering, at the Feast of Unleavened Bread. Virgo at Sunset on September 11th 3 BC, marking Christ’s Birth. Virgo is at zenith, the highest point in the sky during early evening at the start of the Wheat harvest, during the Pentecost Feast. Finally, Virgo is setting in the early evening western skies of the latter harvest, during the Feast of Tabernacles. 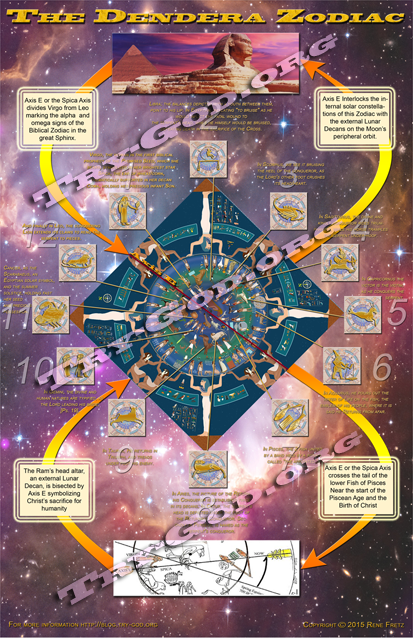 As we see in the graphic above, this matches Virgo’s position on the eve of September 11th, in 3 BC!4 We should be reminded that this was the period when the Sun was clothing Virgo, giving us a beautiful link to Boaz spreading his cloak over Ruth, as a figurative sign of his acceptance and protection of her. Since Boaz was part of the royal genealogy leading to the Christ, the Sun of Righteousness and the light of the world, enlightening Virgo is truly a beautiful celestial figure aligning with this Scriptural truth. It also embodies the Bride-groom [Ps. 19:5], as Christ, the light of the world clothing his Bride-Israel, a figure of the marriage supper of the Lamb, all foreshadowed in Boaz redeeming his kins-woman Ruth! This Marriage Supper of the Lamb will occur during the Feast of Tabernacles, while the latter harvest relates to the 14th day of this seventh month of Tishri. Also, when the Gentile Ruth came to Bethlehem, the birthplace of both David and Jesus and was allowed by God’s Grace, to share in the Lord’s royal genealogy, she was a forerunner of the Gentile Magi who came to Nazareth as the first Gentiles to recognize the promised seed. Remember that it was his star–Jupiter in Virgo leading the Magi to Jerusalem, for their meeting with Herod in search of Jesus. 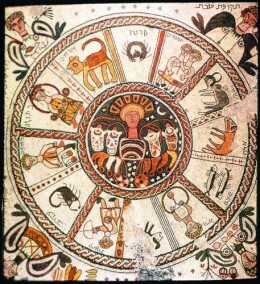 The graphic below depicts, not only the 12 signs of the Hebrew Zodiac mosaic in the floor of this Hebrew Temple, as seen quartered in the four points of the compass or the Cardinal directions. This perspective on the Book of Ruth gives us a panoramic view of the Biblical harvest feasts in light of the celestial events surrounding the birth of Christ. We can see that these harvest feasts were first addressed to Israel in the Old Testament, with important applications to the Blood Moon Tetrads in the Age of Grace marking the victorious return of the Lord Jesus Christ. As we recognize Jesus Christ; the master key to unlocking God’s Word, both written in the heavens and in Scripture, our understanding of the majesty of God’s Word and Works to and for man, is enlightened at new levels of understanding. To establish this pattern we should also expect to see the pattern of these sacred feasts and holy days appointed by the Heavenly Father evident in the ministry of Christ to Israel. The following teaching pertains to and documents the length of the ministry of Jesus Christ as a literal period of 70 weeks according to the prophecies of Daniel 9. If we look at the period of Christ’s Ministry on Earth during his first Advent, we must first realize that the length of his ministry could not be three years because he had to fulfill every jot and tittle of the OT Law or else he would have left mankind un-redeemed, and our salvation incomplete. According to [Ex. 12:5] Jesus as the embodiment of the Passover Lamb [Jn. 1:29, 36] had to be “a lamb of the first year without spot or blemish,” so the length of his ministry could not exceed 2 years at the maximum! The following chart from Rev. Jon Nessle’s Seminar on The Lord Jesus Christ, 5 discloses the seven phases of Christ’s Ministry and the length of his ministry-just over a year. Many of these phases of Christ’s ministry were announced with audible words from heaven, like his baptism where the thunderous sonic boom saying ; “This is My beloved Son in whom I am well pleased.” We have also added the links of these seven phases of Christ’s ministry to Israel with the Lord’s Feasts on the Hebrew Calendar. when he proclaimed the “acceptable year of the Lord” at Pentecost, [Isa. 61:1-2, Lk. 4:17-21]. Thus the pattern of the Lord’s Feasts are all highlighted with major events and transitions in the 7 phases of Christ’s ministry of 70 weeks, as we expect to see this pattern established with the conclusion of the Age of Grace with more voices and sounds from Heaven when Christ returns FOR his Saints, [I Thess. 4:16]. These are the same Feasts of the Lord that have been highlighted by the Blood Moon Tetrads since the Ascension of Christ, culminating in the 2014-15 Blood Moon Tetrad, followed by the Solar and Lunar eclipses of 2016-2017 leading to the rewind of the Rev. 12 sign on 9-23-17 and the Hebrew feasts of 2017. The Second 1967 Mars-Spica union took place 4 days before Passover. Here Mars-Michael the warrior arch-angel stands strong in battle against the Arab enemies of Israel, not only in the 6-day war, but also in the previous war for Israel’s independence, as seen at the Mars-Regulus triple conjunction in Leo in 1947-48′. Israeli military forces recaptured Jerusalem and the Temple Mount on June 7th, 1967, three days after the third Mars-Spica union in Virgo. The Third Mars-Regulus union took place 5 days after Israel’s Declaration of Independence on May 14th 1948. The first Mars retrograde marked the first modern Blood Moon Tetrad in 1947-48 in Leo, with a Mars-Regulus triple conjunction. The following 2 Mars retrogrades marked the next two Blood Moon Tetrads in Virgo, with 2 sets of triple planetary conjunctions of Mars-Spica. Here we find an emphasis on the Alpha and Omega signs of the Hebrew Mazzaroth as seen in the Celestial Sphinx signs leading to the replay of the Rev. 12 sign in Virgo. In this study we have reviewed the pattern of the Lord’s Feasts, highlighted with major events and transitions in the 7 phases of Christ’s ministry of 70 weeks. 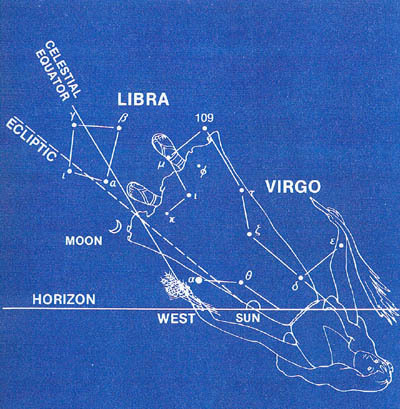 We have also witnessed how the signs of the Celestial Sphinx in Virgo and Leo at both the birth of Christ, and during the modern day Blood Moon Tetrads, have been marked with triple planetary conjunctions of Jupiter and Mars resulting from these planetary retrogrades as we have noted previously in the aspects of the Celestial Prelude. In our next blog we will study some added triple conjunctions that emphasize this message even more! The Heavenly Father is certainly working overtime to get our attention regarding the significance of our current times. As Ministers of Reconciliation, we can all speak the wonderful words of Christ’s redemption truths that have been marked so clearly both in God’s Word, and in the heavens!! 3. Star Lore, Myths, Legends and Facts. William Tyler Olcott, p. 385. 6. “Sound Out 84-A Harmony of the Gospels” American Christian Press 1984.